Time for this owner to sale and get out. There was no cable and no TV boxes to hook up to cable. Internet wasn't very good . The lady at the desk was nice but couldn't help. We will not stay at this park again!!! And if your smart and reading these reviews you won't stay here. We did not check the reviews before going . 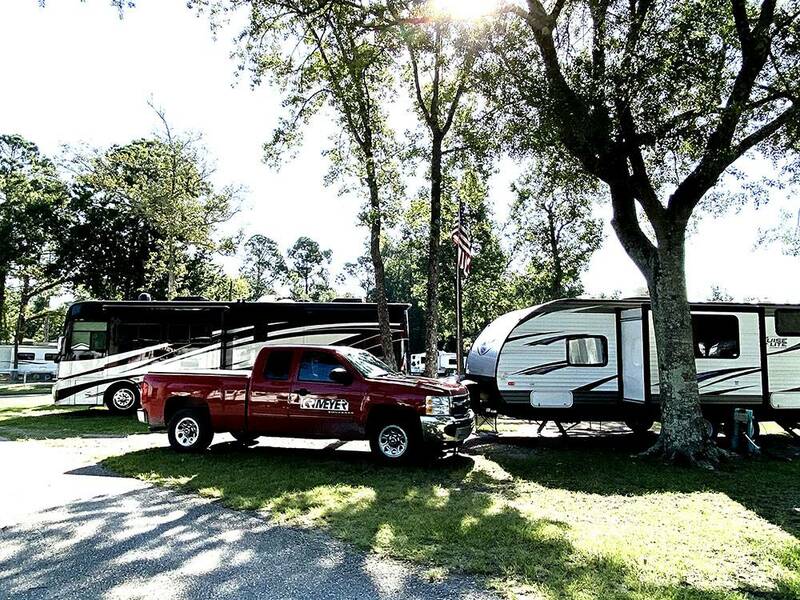 On our way to Florida we needed a campground close to I-95 to stay the night. We made our reservation around 3 PM and told them we would be checking in after hours. We arrived at the park and there was no packet or any indication about what sight we should set up on. I looked around and there was no emergency number visible and no information about a camp host. We took our chances and picked a sight and set up. I guess we did picked ok cause we did not get run off overnight. In the morning I went to the office to pay the lady at the desk and she could have cared less about anything. I would say she was a little rude. The campground is old and neglected. I would not want to stay there for any length of time. On a positive side the campground is only a mile from the interstate and was easy to access. Another plus was they are a member of Passport America so the night with 50 amp service only cost us $20. The road into the park is easy to navigate, some of the roads in the park are narrow and at times blocked by cars. The park has about 145 sites, a number of them are permanent and not kept up all that well. There are a few cabins and tent sites as well. Check in was fast and friendly. We were in Site 42, a gravel and grass pull through end site. We had full hook-ups, no issues and 50 amp electric. The end site was a little wider than the others and there was a picnic table. There is a dog walking area as well as a large field and an old service road at the back of the park. We could get the WiFi to work on our phones and tablet but not on our laptops, we spoke to others who had the same issue. Verizon signal was fair. There is a restaurant on site but it was closed while we were there. We stayed December 27, 2017 - January 2, 2018 and paid $31.00 a night with a combination of Passport America and Good Sam discounts. There was a lot of fireworks and gunshots on site on New Years Eve and construction everyday while we were there. You are minutes from Jekyll Island and downtown Brunswick. This is one nasty RV park. The charge $15.00 to dump. Standing water,junky mtr homes,rude people. Stay away. Very dated. No wifi, cable TV fee $40 refundable after you returned the box. We pulled in for one night, older campers not being used were parked at various lots. Interior roads muddy . Since we were leaving early the next morning returning the tv box to the office after 9am not an option. Only 6 channels available by HD antenna. We pulled out in 10 minutes, gave up our camp fee and opted for another campground. Very disappointed that This would be considered a Good Sam Park. Booked a 3-mo reservation (Dec-Feb) having never seen the park. When we arrived we were put in the "long term" side as opposed to the "overnight" side. The overnight side was perfectly acceptable; the long term side was full of resident tenents who were not made to follow the campground rules (pets unleashed, smoky fires when none were supposed to be allowed, etc.) The sites were close together, which was ok even with 2 slide-outs, but we were surrounded by RVs/trailers that would never be driveable/towable again, and I did not feel safe going out my door to walk my dog alone (day or night). We asked if we could move to the "overnight" side and were flatly refused. We stayed 1 night and moved to a near-by, very lovely campground. This place might be ok for a quick overnight, but I would NOT recommend it for any longer. I signed in and set up my MH. when the cable did not work I went to the office. They said I needed to get a cable box from them. But they did not have any left. So I spent two days there without cable tv. The WiFi would not let my tv hookup. When I left I asked for some type of refund because they could not provide me with the cable box. They said no. I will not stay there again. 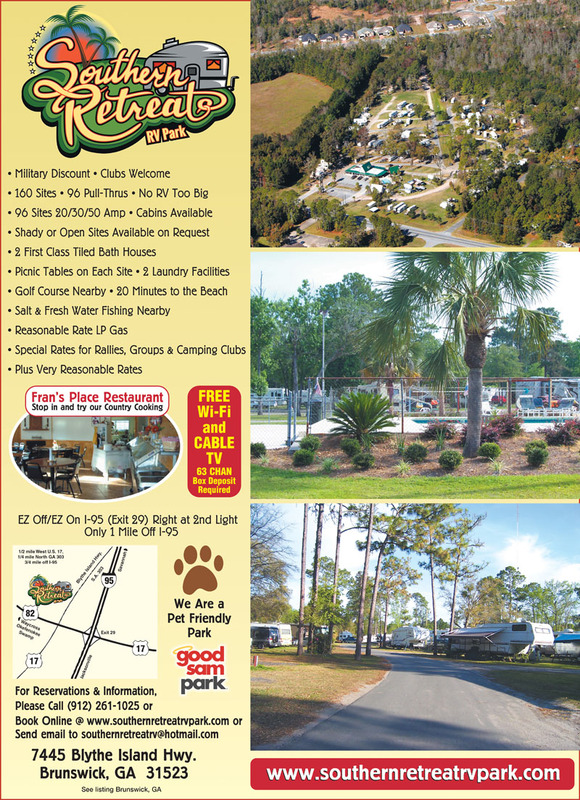 The ratings of this RV Park in Good Sam's Book are extremely overrated at 8/7.5/6.5. This place is little more than a very poor trailer junkyard. Upon arrival there was no power at our site. The electrical post look to be a fire hazard. We changed sites ok. To have cable we had to give a refundable deposit of $40 then it did not work. The restrooms were adequate but had mildew/mold in the corners of the showers. The parameter of the park was filled with broken and unkept trailers and RVs. This park Does NOT live up to what we have been expecting from Good SAMs properties. PLease Good SAM, check out this place and change the ratings in your books/website so other campers will have the true facts. Loved the location and the Buffet was a great way to do lunch after we settled in. There were pot holes in the roads, full of water due to recent rainstorm, but they marked them with cones. We were in a pull thru, but due to location of hookups, had to disconnect and park in front of our rig. A rainstorm in a motorhome in wooded area is never fun, but can't blame the park for the weather. We got allergies and dog got fleas but I would return in a different season. We arrived on a sunny day but out lot was wet with a lot of puddles and this was for the whole campground . Came home and found multiple ticks on my dog they were dead because of meds. this was our worst good sam campground. We talked with others and they left early due to park, one family was planning to stay a week and go a death notice only there one day could not get any money back, restrooms clean but NO heat weather cold in 40's enough said take this one off your list please. Camp is full of permanent residents apparently seeking a lower cost of living. Very low rent area, transients walking through the park at all hours. Didn't feel safe there at all. Restrooms were a shamble, dirty, over-flowing toilets. My biggest question is why Good Sam rates it so good when every review say's it stinks. We were in a Class A 36' with a toad. Most campsites were pull through. People were friendly in the office though! We had reservations for 7 days. Checked in and proceeded to our assigned space. We had to drive through mud, ruts and standing water. The park looked very run down with many very poorly maintained rv's. We drove back out and requested a 7 day refund and stayed somewhere else. This park does not come anywhere close to the Good Sam ratings given. I would not stay here in the future or recommend this park to anyone. My confidence in Good Sam Parks has been diminished considerably. arrived after large rain storm, they were huge puddles in one of the enterienc roads, was startled to see there are campers and trailers for sale up front witch in turn looked junkie. store area is nice inside and they have a buffet. front of park is not great but the back part of camp ground is really very nice. the restrooms leave alot to be desired. the steps are weedy and there are cigarette butts everywhere around the enterienc. i was uncomfortable with the small perment trailer backed right up to the womens restroom. that someone lives in,had to walk right thru their front area to the restrooms, it just didn't feel right. the out blgs looked just bad. this park could really use some work. compared to the other goodsam camp grounds this was a big disappointment.